Look into the life and sayings of Prophet Muhammad(pbuh) and try to extract practical lessons that would be beneficial for the modern day professional. Before we delve into these insights, let us explore 5 reasons why work life balance is so hard to master. By now, you might be thinking that achieving work-life balance is totally unattainable! 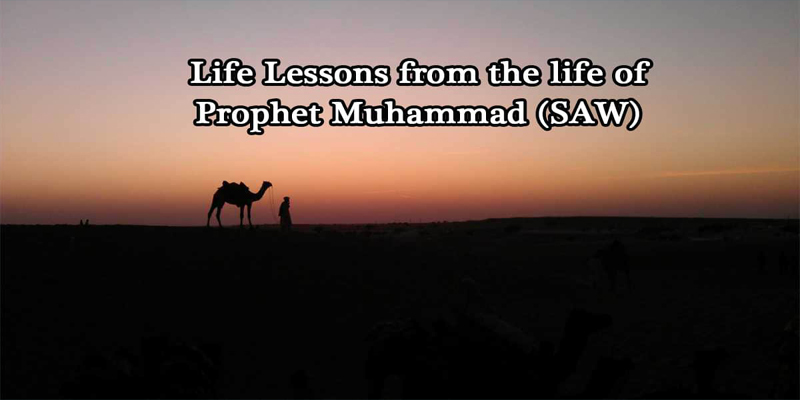 It’s the right time to consider how insights from our Prophet Muhammad’s(pbuh) life and practices. When one observes the daily routine of Prophet Muhammad(pbuh), one cannot resist but notice how balanced & effective it was during his life. This is the man who, in just 23 years changed the face of humanity with his mission. Interestingly, we never hear complaints from his family or companions that “he was too busy” or “didn’t have enough time for us”. The Prophet(pbuh) once heard that one of his companions was fasting everyday and spending all night in prayer. The Prophet(pbuh) made a point to go visit him and advise him not to do this. Here’s what he told him: “…I have been told that you stand all night (in prayer) and fast all day.’ I said: ‘Yes (I do).’ He said: ‘Do not do that. Sleep and stand (in prayer); fast and break your fast. What is fascinating about this incident is how the Prophet made it a point to go and visit the man and advise him to stop. All of this despite the fact that the man was engaged in devotional acts of worship, which one would think the Prophet would be pleased about. The lesson about fulfilling rights above may seem to imply that as long as we fulfill the bare minimum rights to those around us then we’re considered to have succeeded in life.However, another cornerstone lesson that the Prophet(pbuh) taught his followers is to look at our roles from the point of view of responsibility. If you think about what a shepherd does, he doesn’t simply protect the flock, he nurtures and develops them. He searches for new pastures, tends to the sick, ensures that young ones are taken care of, etc. It’s not a passive responsibility but a very active role… Imagine a parent thinking they are fulfilling their responsibility of educating their children by simply taking them to school. Is this person fulfilling the role of [shepherd] of his children? To be a true [shepherd], a parent needs not only to be concerned with their children’s attendance, but also their growth and development as productive citizens. He/she needs to check what they were taught in school, how they are doing with their homework, the manners they are learning, etc. This is how we fulfil in part our trusteeship of our children. There’s a long narration in the books of hadeeth (sayings of Prophet Muhammad(pbuh)). It describes a long account that Ayisha(ra) is sharing with the Prophet about 11 women who tell each other about their husbands’ qualities. Ayisha(ra) goes through each of the 11 women and recounts in detail what each person said. The last story was about a woman called Um Zar who described her husband in positive terms and had no complaints about him. There are various lessons to learn here, but a scholar explained that the main point of this story is to showcase how attentive, present, and a good listener the Prophet(pbuh) was to his family. Something as small as just taking time to listen to your spouse can have a massive impact on nurturing and restoring balance to your relationship. When it comes to achieving a total life balance, a lot of the time, the small things are the big things.